Contemporary yet classic. Lavish yet refined. The Straits Ballroom, our largest event venue, reinterprets weddings and banquets with traditional Eastern touches and modern European flair. Your guests arrive at the Celebrations & Events Centre via a private driveway, greeted by the airy lobby and panoramic ocean views. 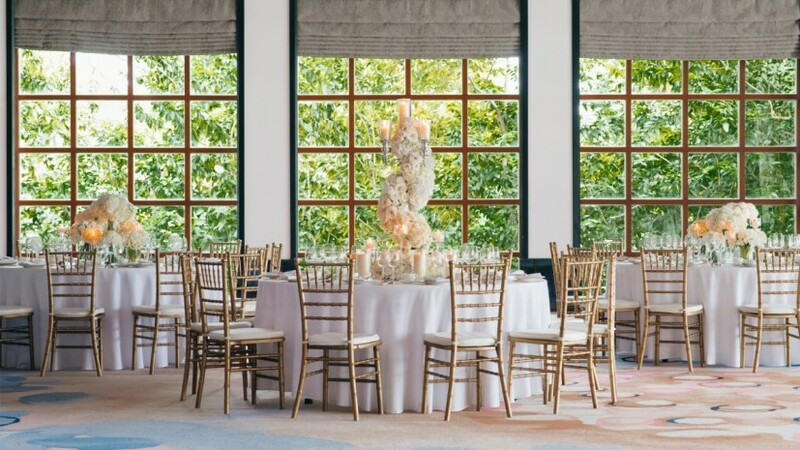 Entering the grand ballroom, walls of windows and French doors bring the outdoor gardens in, while the décor of this airy space – with its gleaming wood paneling and abstract floral motifs on the plush carpet – reflects the tropical paradise theme . A natural extension of this beautiful venue is the Straits Veranda, an inspiring open space that can accommodate up to 150 guests. Admire the view, enjoy soft sea breezes and create unforgettable memories. To get ready for your big event, take advantage of our Bridal Suite. Located just steps from the ballroom, you have access to this 30sqm space throughout your wedding day.